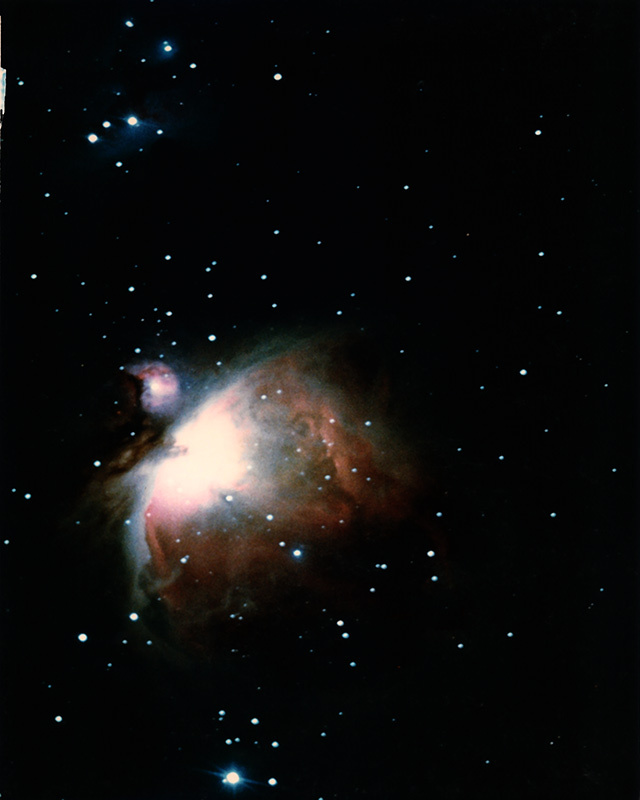 I have an image of M42 I made in 1989 on Kodak VR Gold 400 print film of M-42 and NGC 1977 I took with the 10" F/4.5 Newtonian mentioned below. Taken on 9/30/1989 at 9:06 UT at the cabin near Kenosha Pass, CO. Olympus OM-1 Camera with the Lumicon Newtonian easy guider with field flattener. The guider and flattener I got in 1986 is still being used today on both of my scopes. A single 60 minute exposure on the VR-400 film, manually guided. The negative was scanned with the Epson 4490 Photo scanner. I had 2 earlier scanners, the first was a basic 8-bit 35mm filmstrip scanner. The second was a top Minolta 16 bit scanner that did 120 film also, but the denser negative or slide luminance end was limited. This scan was done using the 16 bit well depth to rein in the saturated center in M-42. This is the original 8x10 E-surface darkroom print scanned with a cheapie HP scanner that came with my previous computer. The center is blown out. There is another lighter print on the next page in the album with most of it blown out to pick up the extensions. The single spike and oblong stars were from the single bar spider in the Meade DS-10 telescope. 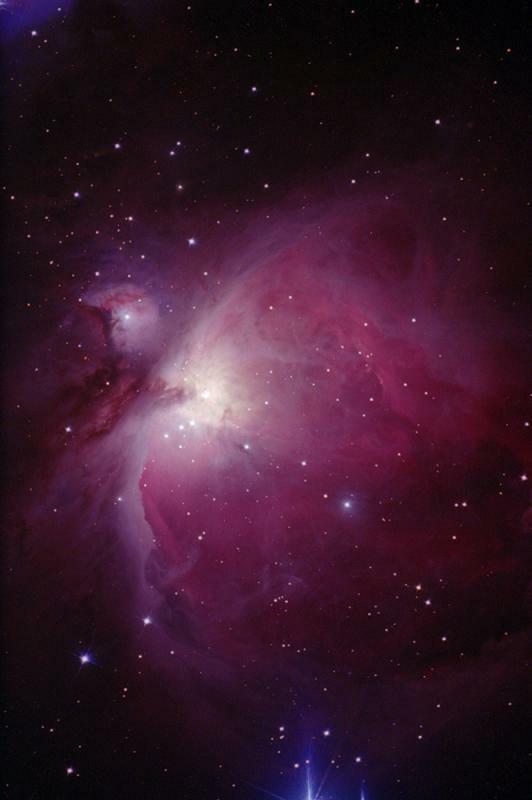 I joined the Denver Astronomical Society 2 years later with this photo with an album full of others and the members were impressed with this result! It took a lot of darkroom manipulation to get the blown out center down as most entries in the publications had the center blown out. The CCD version with two versions of the ST-2000 XM camera mentioned below Taken in 2008 and 2009. Mosaic of 10 images with the same 10" F/4.5 optical train with the larger drive gear and new secondary spider. NGC 1977: 10 minute Astro Don LRGB, 5 minute subs. 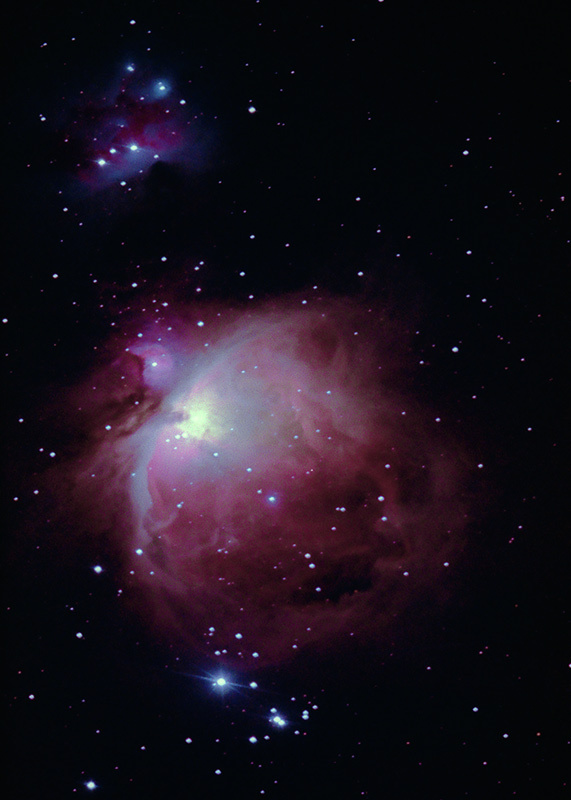 M-42: 10/10/7/10 minute singles with the Custom Scientific LRGB filters. Edited by Joe F Gafford, 06 July 2017 - 02:25 AM. Manually guiding for as much as 90 minutes for a M-31 was the norm back then. Then around 1994 the Royal Gold 400 and the pro PPF-400 v.1&2 films had a better red response with the newer and smaller tabular grains did limit the exposures to 25 minutes at a dark site before picking up the sky glow! Sky glow was grainy noise. The Royal Gold v.3 lost the red in 1999 due to complaints that it turned the flesh tones too red around sunset. The red PPF films were dropped and repackaged by special order for the law enforcement detectives as 'Crime Scene Film'. The M-42 was done at the cabin with a windscreen made from scrap tubing, rope and an old tarp on the windward side, up the valley. The 10" had the original saddle mount and the tube did not turn as it does now with the Baltic birch rings I purchased later. I sat on a 6 gallon white bucket on a metal folding chair, while guiding and going over the top as the OTA moved with the sky. I didn't hear of the "Denver Observing Chair" developed by two DAS members until I joined the club later. The variants of that chair is made by some sources today. Excellent pictures. That's an achievement to be proud of. Simply stunning. Congratulations! BTW, get off my lawn! Long-time astrophotographer here, returning to the fold after a long absense. I eased out when TP2415 went out and my Microtek slide scanner died. I'm getting back in with new-fangled digital equipment on my trusty old scope. Expertly done! These would be a worthy goal to strive for in my meager AP (film or otherwise) attempts. I would also say it helps to have a fast scope! This is another example of M-42 taken with film 8 years later in 1997 with my 18". Taken on 9-27-1997 At the Pawnee Grasslands campground near Briggsdale, CO. This was an unusual night as the transparency and seeing was excellent for this area. The example in the first post above was taken with the Kodak VR-400 print film as this one was taken with the Kodak Royal Gold 400-2 print film, a similar emulsion to the pro PPF-400 version at that time. These emulsions disappeared around 2000 and so did the red Ha response. 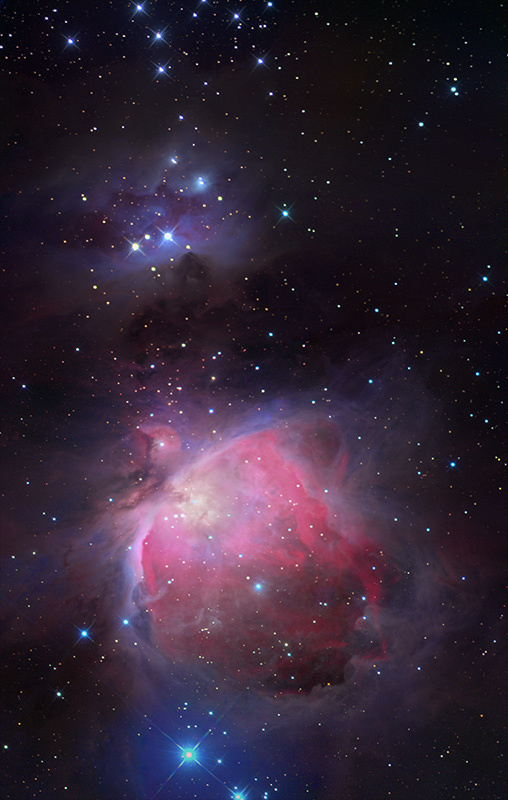 Notice the extensions of M-42 in this 10 minute image has more of them than the 60 minute image in the first post. Those are pretty close to the colors I used to get with Elite Chrome 200 (example here). The problem I had with that particular film was that it didn't capture blue all that well (for me - others had better luck, it would seem) and it didn't capture the green colors in planetary nebulae at all. For example, the Veil always turned out red for me, as did M27. DSLRs seem to have much better color balance for nebulae. Very good point about re-scanning and/or re-processing old slides and negatives. I need to go through my entire slide collection (I always shot slide film) and redo them. I like to say there's gold in them there emulsions.